New changes to Dog Law UK will tighten dog control and should increase protection for people like postal workers and couriers who are attacked by dogs, while doing their job. But it also means anyone bitten by a dog will need expert advice more than ever before, says senior personal injury solicitor Chris Shaw. For only a specialist can be sure of safely delivering results for a client, who has suffered a dog bite injury, in the increasingly complex legal landscape. 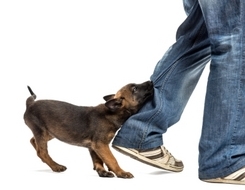 Chris, who runs expert claims firm Shaw and Co Solicitors UK, said choosing the right personal injury solicitor for a dog bite compensation claim, is critical, whether someone was attacked at work, on private property, or in the middle of the street. Every year an estimated 210,000 people in England are victims of a dog bite injury, more than 6,000 of whom are hospitalised. Postal workers are particularly vulnerable - 4,000 dog bite attacks a year, with 400 so badly mauled they need time off work. With the risks so high, and the laws so complex, anyone attacked by an animal may feel it is a lawyer, and not a dog, who is their best friend, said Chris, whose company successes include ground-breaking cases which have become legal landmarks. He said: “It’s just crazy to go to a general claims solicitor for something of this sort - like getting an odd job man to repair a few roof slates on your house. By 2016, all dogs - all 8.5 million of them, according to the RSPCA - will have to be microchipped, and MPs want householders held responsible when their dogs attack people like postal and delivery workers on their property. Until now, the Dogs Act, passed in Victorian times, and the more recent Dangerous Dogs Act and the Animals Act have been the legal keystones on which legal action can be taken. But few people realise that it can be very difficult to act against a dog owner if the attack is on private property. The new proposals will change that. Said Chris: “The government’s own figures show the worst area for dog bite attacks is the North-East of England, followed by Yorkshire and Humberside. “We’re based at the heart of these regions, and that’s one reason we have such vast experience - and a good record of securing compensation for postal workers, couriers and delivery staff bitten during the course of their work. Other dog bite compensation claim cases include a postman badly hurt when he landed in a ditch after leaping a fence to escape a dog. He received £7,500 compensation. The firm represented a driver awarded £2,000 after being attacked by a farmer’s dog while delivering cement. A woman bitten on the hand through a letterbox while posting advertising leaflets won a similar amount. Shaw and Co Solicitors UK are personal injury experts who also deal with Equine Law and indeed all forms of personal injury claims UK. They represent all of their clients on a No Win No Fee basis.